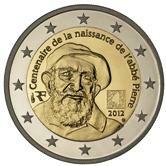 This coin honours Henri Antoine Grouès, a well loved Frenchman and catholic priest, who devoted his life to caring for the poor and homeless and founded the charity “Emmaus”. He was known as “Abbé Pierre” – a name that comes from the time of the resistance when he helped French and Jewish refugees. He came from a well appointed industrial family and divided his inheritance among the poor. He purchased a building which was used to provide refuge for the homeless. A radio appeal he made for the homeless resulted in donations of around 500 million francs. In the inner circle is a portrait of the famous Abbé. Around the top edge of the inner circle is the inscription:” Centenaire de la naissance de l’abbé Pierre”. (Centenary of the birth of Abbé Pierre).Between eight and nine o’clock we see the mint mark and the country designation. The year of issue and the mark of the designer(a pentagon) appear between four and five o’clock. Immediately above the year of issue is a small rectangle, the logo of his foundation, in which is written in micro text “Et les autres?”(And the others?). This was his favorite motto – reminding us to always think of those needing our help. All in all, a very interesting commemorative coin. Return from French Commemorative 2012 to euro coin collector.